Leadership is never identical because people are all different. Even identical twins aren’t identical in how they think, or how they communicate, or how they view the world. There’s no telling how many books I’ve read on leadership, or how many hours of conversation (and lots of questions) I’ve engaged in to learn more about it. For as long as I can remember, I’ve wanted to unlock the keys to being a great leader. My early fascination with it wasn’t because I aspired to it…as much as it was about just wanting to understand how a leader could influence the outcome. I remember reading about how effective some tyrants (like Harold Geneen) were and being somewhat depressed that a bad guy could be effective. When I was young I wanted to think that only the best behavior paid off in the executive suite. Today I’d still like to believe that, but I know it’s not true. Bad people can be effective leaders if we measure only results (and lots of people do). Effective leadership can come at the hands of evil, ill-behaving men. No, I’m not suggesting we do that, but I do acknowledge that it can happen. “Over the long haul, better leadership will prevail,” someone once said to me. I was in my early 20’s. He was in his 60’s. I wanted to believe him, but I was skeptical at the time. Now I sit here decades later and I know he was wrong. Yet I’ve not wavered in my convictions — the very best leaders produce results by being a positive influence on the lives of the people they lead. That context is important for today’s show because our subject isn’t one embraced by all leaders. Not even by all effective leaders. But I’ve never met a single effective leader who agreed with my convictions who didn’t devote himself or herself to the practice. As tempting as it may be to join the ranks of the autocrats who rule over their enterprises with Vise Grip™ kind of control, it’s not the best course in my opinion because I think being a good person matters. It impacts people’s lives for good. Thanksgiving is a major building block for effective “good guy” leadership. Let’s talk about being true to our course, or the course we most want to pursue. I don’t know where you’re at in your career. Maybe you’re just starting out, or maybe you’re early in still trying to figure out who you are as a leader. Maybe you’re well into the curve and you think you’ve mostly got it figured out. Or maybe you’re coming out of the curve of knowing it all and coming to terms with how little you know. It really doesn’t matter where you are as long as you’re still in the game. I’m encouraging you to assume that service is at the heart of leadership. Yes, we can all cite examples of miserable people who effectively led wildly successful organizations. Don’t get distracted by their example and think tyranny is the way to go. Instead, let me challenge you to consider another possibility – what if they were effective not because of their tyranny, but in spite of it. We often attribute the brilliance of Steve Jobs to his mania without regard to people. But what if Steve Jobs found wild success in spite of his poor behavior. What if he’s behaved better toward people? Could he have pushed people as hard – maybe harder – if he had be able to show better appreciation? We’ll never know. Unfortunately, we look at such characters and attribute their success to their tyrannical behavior. Yet, that’s not necessarily the reason for their success. It’s just as easy to assume they may have achieved even greater success if they had behaved with more grace. Maybe not. We’ll never know. All we can do is roll the best way we know how – and go in a way that’s true to who we are, and who we most want to be. I’m optimistic that you want to be a force for good in the lives of the people in your company or organization. I’m hopeful you want to produce spectacular results by building remarkable people! Remarkable. Dazzling. Those are 2 words I latched onto when I was in my 20’s running a company. For good reason. I was grateful for the opportunity to operate a company at such a young age. By that point I had a decade of experience working for a variety of leaders, most of whom were not my vision of ideal. Many didn’t spend any time developing people, or even looking for ways to help people elevate their performance. So I was intent on first building an organization, which meant I wanted to build an environment that fostered ongoing, continuous improvement in the individual performance of people — so that together the team’s performance could soar. I was in the luxury retailing business, which meant our service had to be extraordinary every single time. But the genesis of it all was gratitude. My own gratitude stemmed from a sense of responsibility to do great work for the company by first serving the employees, then the customers. Obligations are powerful motivators. More powerful still is the gratitude we should feel and acknowledge. Gratitude provokes service. Service is at the heart of quality leadership. 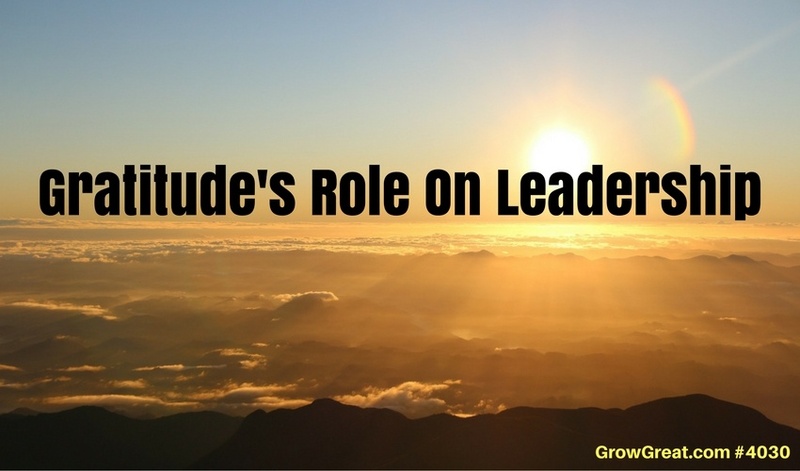 But gratitude serves one fundamental driver that can fuel leadership like nothing else. Leaders who approach work with a single focus on what they want, concentrating only on imposing their will, are stuck in their thinking, their approach and their creativity. Leaders who remain focused on their blessings with a sense of thanksgiving and gratitude necessarily understand a bigger picture. The universe doesn’t bend to their every will and they’re okay with that. Rather, gratitude compels them to consider how they can most benefit those they lead. They see a bigger picture – one where all the team members fit together to accomplish what might otherwise go undone. I’ve been watching this Audience Channel (DIRECTV) series on My Fighting Life about the soldiers serving in Afghanistan. The video is all produced by the helmet cams from the solider’s themselves. Over and over we hear these young men talk about the power of serving in a deployment of mere months and how it bonds them to their brothers in arms. When it’s all over and they return home, they mostly miss the camaraderie of being part of a unit – something bigger with a purpose. Being grateful is good. It’s valuable. It’s right. But it also serves leaders to consider different approaches, to morph their ideas and creativity based on those they serve and the outcome being pursued. That adaptability has enormous benefits in the market. Gratitude also helps leaders with external feedback, too. Besides being grateful for the things inside the organization, good leaders are grateful for the market they serve. Customers are people, too. Behind every purchase order or invoice paid is a human being served. Great leadership never forgets that. Gratitude for and toward customers provides fast, valuable feedback that no focus group can match. When the CEO or top leaders is plugged into their own gratitude, their teammates and their customers (or potential customers), they’re going to be tough to compete against. It’s more than being a good person. It’s smart. Wise. In practical terms it’s fast and agile because the connectivity with people provides direction that the ungrateful leader will never recognize (or they’ll see it too late).